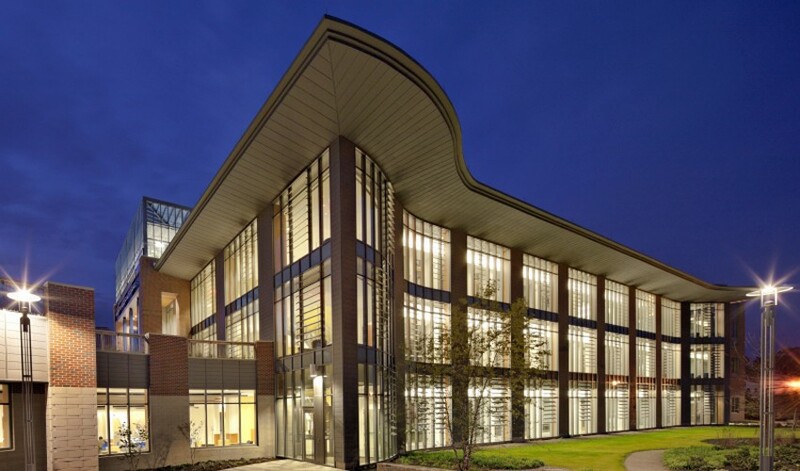 The Wheaton College Mars Center for Science and Technology has been recognized as a LEED Gold design since its completion in the fall of 2011. Considered the most ambitious construction project in Wheaton’s history, the three-story, 73,000-square-foot facility was designed by Einhorn Yaffee Prescott (EYP) and reflects Wheaton’s commitment to environmental sustainability. The center houses 14 teaching and 23 research laboratories that serve a variety of disciplines as well as a café, study/social spaces, a greenhouse and vivarium. Sunrise furnished and installed metal, phenolic, and wood panels on the center, thus playing a large role in the exterior design of the LEED certified facility.